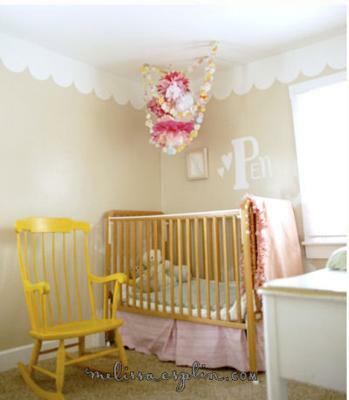 This project is called the "chic but thrifty pink and yellow nursery for a baby girl" because, Melissa Esplin was determined to finish this project with results that indicated that there were unlimited funds at her disposal targeted for decorating purposes without actually spending much money. And this talented mom did manage to design this very attractive room for much less than you might imagine and she is going to share tips as to how she did it. 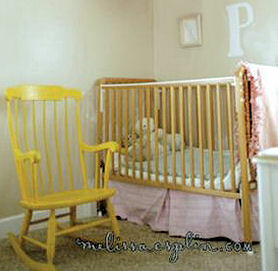 Chic but thrifty pink and yellow nursery decorating ideas. Melissa made all the right decisions including designing the room around the neutral color walls and painting furniture to give it a modern look for a modest price. Go here to See more. .
Keep reading and you will eventually learn the total PLUS she is going to share a few tips on how to make a scalloped wallpaper border and how she made the colorful paper ceiling arrangement. What were the most effective money saving decisions did you make along the way? Along with using the existing tan wall color and re-painting furniture pieces that we already owned, I managed to score some great deals along the way. I would rather that the nursery walls and floors have been painted white. Painting the furniture white opened up the space so that the room is airy and bright in spite of the less than desirable wall color. Speaking of bright, colorful features in the room, can you tell us a little about the ceiling arrangement and how you made it? The inspiration for this decoration came from one that I saw in a nursery picture online. I was blown away by the concept and just had to create my own version. I followed Martha Stewart’s tutorial for making tissue pom poms, attached them to a length of satin ribbon and stapled them to the ceiling. Then, I sewed together (a jillion?) irregular circles that I had cut out of Hippity Hoppity paper. The picture doesn’t give an accurate view of how light the paper circles are. It’s simply mesmerizing to watch how they dance and spin in even the most gentle breeze. Was the scalloped wallpaper border difficult to apply or create? I had worked with contact paper before decorating the nursery so I thought I’d give it a try. Honestly, applying the contact paper to the wall was the most difficult part of the process. Pulling the lining paper off and getting it on the walls without any air bubbles was definitely a two person job. My knee squeegee came in very handy for smoothing the paper. Cutting the scallops was a cinch once the template was made. It took several hours for two of us to get the paper on the walls and just under an hour to cut them out. All that I had to do was score along the edge of the template very lightly and I got perfect cuts every time. I’m really happy with how the border turned out. I love the makeover that you gave the furniture. Were these some of the deals that you mentioned? If they are, you are the luckiest lady ever! They are gorgeous! The desk and night stand are furniture that my mom had in her room when she was a child. I’ve always loved them and was so happy to have them in Penelope’s room because they have such beautiful lines and feminine details! They were similar in style but slightly mismatched so I painted the wood white and the hardware yellow to give them a modern look and tie them together. The crib that was was handed down from Chris’ parents after being used by all six of the Esplin babies was also in need of a makeover. I had a vision of a white, freshly painted crib to go with the other pieces we had just painted but Chris was very reluctant. It was very hard for me to let go of my plans for the bed and just before I did, Chris relented on the condition that I would be the one to paint it. I went along with his condition and I’m really happy with the end result. Having these beautiful, sentimental items in our baby’s is so sweet and I love it. 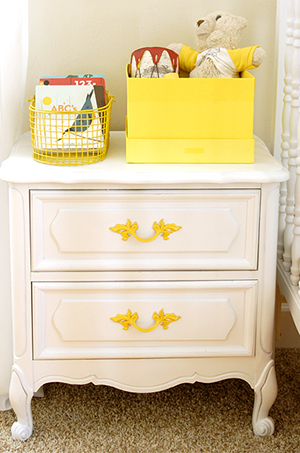 Were there any chic but thrifty pink and yellow nursery furniture splurges? I guess the chairs that I bought from Ikea were a little bit of a splurge, but they were just too cute to pass up. I also found the trash cans at Ikea for $50. If I had had more time for thrifting I probably could have found something similar less but I was impatient and I had a gift card to cover the purchase plus I got a great deal on the Eames rocker so it was alright that I was a little frivolous on the cans. Could you tell us about the wall decorations? My sisters and I and Penelope all have worn the baby girl’s dress decorating the wall above the trash and my mom cross-stitched the teddy bears in ballerina tutus. For sentimental reasons and because Penelope has a special love of dance, the artwork is perfect for Penelope’s room. That is the end of our chic but thrifty nursery tour here on Unique Baby Gear Ideas and I know you are dying to get those final figures that I promised at the beginning of the article. 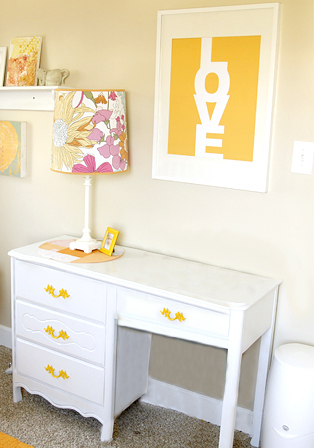 Drumroll please…Melissa created this incredible room for just over $300. 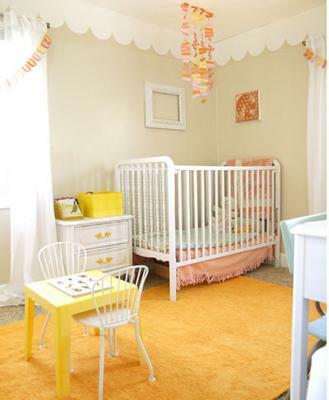 Her hard work, excellent nursery decorating ideas and attention to the details that count really paid off! If you would like to see more of Melissa's creative crafts and DIY projects when you leave Unique Baby Gear Ideas, please visit ISLY but please leave a comment here before you go! Here’s a breakdown of the resources for items that were bought for use in the nursery. If you are looking for a particular item and don’t see it listed here, I probaby had it on-hand already. I love the DIY scalloped wallpaper and wonder if you could please direct me to a tutorial with a list of craft paper, supplies and equipment that I would need to have in order to make something similar. Thanks!